Combination of probiotics and prebiotics. 5 billion micro-organisms per capsule. Helps maintain and restore the balance of vaginal flora. In some cases of vaginal infection, there can be disruption to the delicate balance of vaginal flora. In order to restore this balance, scientists have identified the probiotic strains naturally present within vaginal flora which include, in particular, Lactobacillus GG, Lactobacillus rhamnosus, Lactobacillus reuteri, Lactobacillus plantarum and Lactobacillus salivarius. To improve vaginal health and comfort and prevent infection, ‘Vaginal Health’ vitamin thus contains some of these scientifically-identified strains – Lactobacillus rhamnosus, Lactobacillus salivarius, as well as Bifidobacterium lactis, Lactobacillus acidophilus, Lactobacillus casei and fructo-oligosaccharide. The latter ensures these various micro-organism strains are nourished, healthy and able to reproduce. 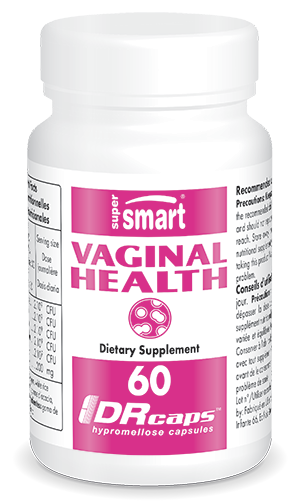 The dietary supplement ‘Vaginal Health’ has been specially formulated for maximum efficacy. Its delivery in DRCaps™ offers maximum absorption and provides 5 billion ‘friendly’ micro-organisms per capsule. At the recommended adult dose of two capsules a day, you will actually benefit from twice this amount of micro-organisms. ‘Vaginal Health’ vitamin can be used as a treatment for two to six months, and in some cases longer, provided the dose is reduced. If in doubt, you are advised to consult a health professional.